Drought could be defined as abnormally dry periods (below-average precipitation) at a given region, leading to a shortage of soil moisture and eventually water resources scarcity. It should not be confused with low rainfall conditions that are normal to areas with arid and semiarid climates. During drought, precipitation amounts fall significantly short of long-term averages, posing adverse effects on the environment, including plants and animals, depending on their sensitivity to duration and severity of water stress. If droughts persist for longer periods, they can disrupt local to regional hydrologic cycles, agriculture productivity, ecosystem services and the overall economy. Drought is different from other natural hazards such as flood or wildfire, where the negative impacts are felt very quickly. Drought follows a slow and accumulating process, and it is difficult to determine the beginning and end of this process. This characteristic makes drought preparedness very challenging. Usually, the first evidence of drought is indicated by the deficiency in precipitation and it slowly grows to affect components of hydrologic budget such as evapotranspiration, soil moisture, surface runoff and stream flows. This slow and gradual process follows a sequential pattern with impacts that are experienced by different sectors at different timescales. Meteorological drought is characterized by significantly lower precipitation (rainfall and snow) compared to “normal” (long-term average) condition, accompanied with smaller atmospheric humidity (drier) and larger evaporation demand. Meteorological drought is region specific because the atmospheric conditions that result in below-average precipitation are highly variable from one region to another. Agricultural drought is primarily related to soil moisture scarcity in the crop root zone to fulfill crop water demand during the various growth stages. Agricultural drought does not depend on precipitation only, but is interlinked with soil and crop characteristics such as crop water requirement. It is characterized by a shortage of irrigation water, supplied by precipitation, soil water, groundwater or surface water. Besides these, crop growth stage influences the onset and intensity of agricultural drought. For example, crops need more water during the development stage, compared to early or late growth stages. Therefore, the same amount of precipitation during different crop growth stages have different level of impacts. Hydrological drought is characterized by decreased flow in streams and rivers and below average water levels in lakes, reservoirs and groundwater. Hydrological drought shows time lag (out of phase) in occurrence with respect to agricultural drought, because it takes longer time to see the impact of precipitation deficiency on river flows and water levels in surface and groundwater sources. For example, less precipitation can result in decline of soil moisture immediately with potential onset of agricultural drought. However, it may take longer to see the impact on water resources. Socioeconomic drought differs from other types of drought as it is associated with the supply and demand of economic goods. Socioeconomic drought occurs when the supply of an economic good fails to meet the demand as a direct or indirect impact of drought. Both demand and supply vary with time and space. For example, demand of economic good increases with increase in population. Drought information can be obtained from multiple regional and national sources. Some of the commonly used sources are presented in Table 1. Table 1. Sources of national, regional and state drought information. Oklahoma is located in a marginal region between humid eastern and semi-arid western climates, which makes it vulnerable to both short- and long-term droughts. Drought is a normal and recurring aspect of Oklahoma’s climate. Short-term (few weeks) drought events are common and tend to occur every year. Long-term droughts, extending anywhere from full crop growing season to several years, have been frequent in recent years. This has caused devastating agricultural, hydrological and socioeconomic impacts affecting many Oklahomans. Oklahoma’s precipitation history shows decadal-scale repeating cycles of wet and dry periods lasting about five to 10 years. Extremly dry periods resulted in major droughts in the 1910s, 1930s, 1950s, 1960, late 1970s and early 2010s. The 1910s drought period had the lowest 10-year statewide rainfall on record. The meteorological severity of the 1930s drought (known as Dust Bowl) was less than those of the 1910s and 1950s, however it had the longest period for about 10 years and left deep scars on the state’s economy. While there are limited records on the economic impact of this event, federal assistance may have reached $1 billion (in the 1930s) by the end of the drought. This tragic event severely impacted Oklahoma and led to the migration of about 59,000 citizens. The 1950s drought period had the driest five consecutive years (1952 through 1956) in the state’s history. During 1995-1996, wheat production in western Oklahoma counties was reduced by one-half, which was the lowest in the previous 25 years. Because of this, many Oklahoma producers went bankrupt and had to quit farming despite release of federal assistance. A similar impact on winter wheat was observed in the 2001-2002 drought. The lower winter wheat yields resulted in loss of more than $150 million in revenue. Alfalfa and hay production losses were as high as $60 million due to very hot summer in 2001, and most of northwestern Oklahoma was almost without grass production by early 2002. In 2011, the U.S. faced widespread drought, which prevailed over 81 percent of the land at various times and caused estimated damage of more than $30 billion. Oklahoma alone lost more than $2 billion in drought-related agricultural losses between 2011 and 2012. Losses in general (e.g. cotton, soybean, hay, etc.) and horticultural crops were estimated about $900 and $81 million, respectively, during the recent drought of 2011. About $670 million losses were also estimated in livestock production from this drought, primarily in cattle production. Agriculture is usually the first sector to be affected by the onset of drought because it relies on precipitation and soil moisture availability during various crop growth stages. It is important to note that areas with sufficient irrigation water supply may have less susceptibility to drought. For example, the Oklahoma Panhandle has access to Ogallala aquifer groundwater to meet irrigation demand even during droughts, whereas many growers in southwest Oklahoma rely on surface water for irrigation, which may run dry during long-term droughts. However, the cost associated with and the sustainability of tapping groundwater resources are additional factors to be considered for the overall analysis of drought impacts on agricultural productivity. During drought events, available water resources deplete at a faster rate, creating serious sustainability issues for the long term. In Oklahoma, irrigated agriculture accounts for 41 percent of total water use, which is about 744,000 acre-feet (242 billion gallons) per year. The future water demand projection in the Oklahoma Comprehensive Water Plan suggests that crop irrigation will remain a major water user in the future, with a projected annual demand of about 900,000 acre-feet (293 billion gallons) in 2060. The continuous increase in irrigation demand makes agricultural water resources more vulnerable to frequent and severe droughts. This requires immediate attention and long-term planning, especially since research shows that Oklahoma’s water resources are very sensitive to the length and severity of drought events. Regarding surface resources, the impact of the 2011 drought was most significant on Lake Altus in southwest Oklahoma. In July 2011, water storage at the lake was 31,718 acre-feet, or about 70 percent less compared to July 2010 (104,571 acre-feet). Due to this significant decline, no water was released to the Lugert-Altus Irrigation District. Consequently, irrigated area decreased from about 44 percent of the total district area in 2010 to near zero in 2011. 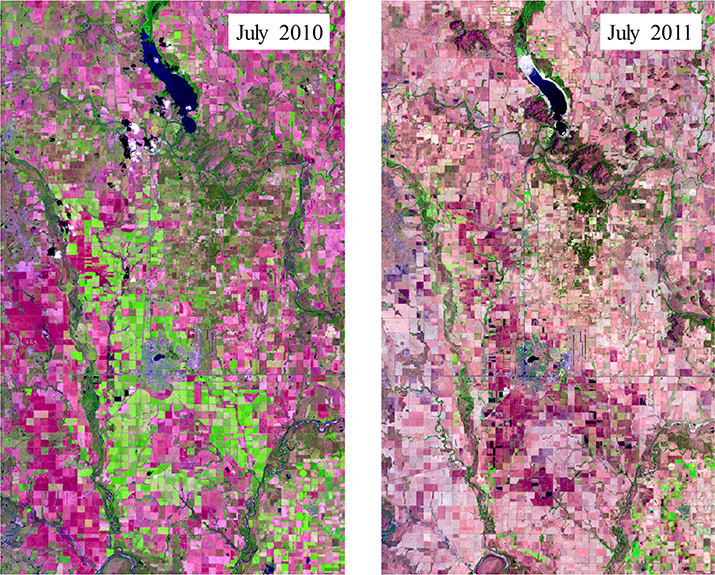 Figure 1 demonstrates two satellite images of the Lugert-Altus Irrigation District, taken in July of 2010 and 2011. Reduction of water levels in Lake Altus (upper-center of the images) can be seen as the water surface area with dark blue color shows a significant decline, especially at the north end of the reservoir. 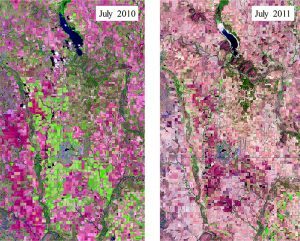 Green color shapes south of the lake and around the city of Altus represent irrigated fields with healthy crops, which essentially disappeared in July 2011. Figure 1. Water storage in Lake Altus and irrigated farmlands in the Lugert-Altus Irrigation District in July 2010 and 2011. Water levels in Lake Altus had continued to decline during the remainder of the drought period (Figure 2), experiencing a total decrease of about 17 feet. By July 2014, the water storage in Lake Altus had dropped to 15,759 acre-feet, which was about 85 percent less than that in July 2010. After rainfall events in early 2015 and the end of the drought, water levels increased and even exceeded July 2010 levels. Figure 2. Fluctuation in water levels in Lake Altus between Jan. 2008 and Jan. 2017. Similar to Lake Altus, reduction of water storage in other lakes was observed across the state. For example, Stanley Draper Lake near Oklahoma City lost about 38 percent of its storage capacity in July 2011 compared to July 2010. Water storage in Lake Ellsworth and Lake Lawtonka reduced by 41 percent and 15 percent in July 2011 compared to July 2010, respectively. The loss of water from lakes and reservoirs during the drought not only limited the water available for agriculture, but also impacted public and private water supplies, fish and wildlife habitats, recreational activities and many other uses with significant contribution to the state’s economy. Beside surface water sources, groundwater sources experience elevated stress during droughts. In Oklahoma, 73 percent of the irrigation water is supplied from groundwater resources, so groundwater plays a vital role in securing the sustainability of irrigated agriculture. The Ogallala aquifer, which is a major source of irrigation water in the northwest and Panhandle regions, has been diminishing during the past few decades. This has caused a significant decline in well capacities and an increase in pumping costs of water extracted from deeper levels. Research shows that groundwater is being pumped at higher rates during droughts, causing water levels to drop at a significantly faster rate compared to non-drought years. Based on water level data collected from 42 monitoring wells across the Panhandle, water levels in the Ogallala aquifer declined 19 feet from 2001 to 2017. Out of this total decline, 9 feet of the decline occurred during the recent drought of 2011 to 2015, meaning that 47 percent of total water level decline was experienced during just 25 percent of the study period (Figure 3). The average rate of decline during the drought period was 2.2 feet per year, or 2.75 times greater than the 0.8 feet-per-year average decline during non-drought years. Figure 3. Groundwater level declines in the Ogallala aquifer. Rush Springs is the second most important aquifer within the state and provides irrigation water to growers in Caddo, Custer, Washita and Grady counties. Similar to the Ogallala aquifer, the Rush Springs aquifer has experienced depletion during droughts. Based on the data from 12 monitoring wells, the water level in the Rush Springs aquifer dropped by 10 feet during a 16-year period (2001 to 2017). About 70 percent of that decline was observed in just four years (2011 to 2015) mainly due to drought conditions (Figure 4). The average rate of water level decline during drought years (2011 to 2015) was 1.8 feet per year, nine times the average decline rate in non-drought years (0.2 feet per year). Figure 4. Groundwater level declines in the Rush Springs aquifer. Unlike Ogallala, the Rush Springs aquifer showed increases in groundwater level after rainy periods in 2005, 2007 to 2009 and 2015 to 2017. This is because water in the Rush Springs aquifer is much closer to the surface than the Ogallala aquifer. For example, average groundwater depth in January 2017 was about 70 feet in the Rush Springs aquifer, compared to about 205 feet for the Ogallala aquifer. The Rush Springs aquifer is hydrologically connected to surface water resources and responds to precipitation, which makes it more resilient to long-term drought impacts. On the other hand, the Ogallala aquifer has a near-zero recharge rate and demonstrates no response to wet and rainy periods following drought. In this respect, the Ogallala is like a savings account that allows for withdrawals but no deposits. This work was supported by a joint research and Extension program funded by the Oklahoma Agricultural Experiment Station (Hatch funds) and Oklahoma Cooperative Extension (Smith Lever funds) received from the National Institutes for Food and Agriculture, U.S. Department of Agriculture. Additional support was provided by the Oklahoma Water Resources Center through the U.S. Geological Survey 104(b) grants program.